JKBOSE 10th Board Examination 2019 timetable has been published. The board examination will commence by 27th Feb 2019. About: Jammu and Kashmir Board of School Education(JKBOSE) is the State Board of Secondary Education in the State of Jammu and Kashmir. It conducts board examinations for Secondary and Higher Secondary classes. 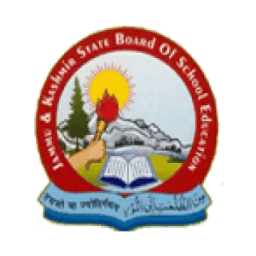 History: Jammu and Kashmir Board of School Education(JKBOSE) was established through legislation under the Jammu and Kashmir State Board of School Education Act, 1975. It provides the courses of instructions, scheme of studies, prepares the syllabus, curriculum and textbooks for the School education as per the National Policy on Education. Jammu and Kashmir Board of School Education will declare regular board Exam Result by May (tentative) 2019 for candidates who have appeared for the class 10th Exam. Two Date sheet: JKBOSE conducts two exams a year one in Kashmir and another in Srinagar. They are referred as the Spring and Winter Exam. 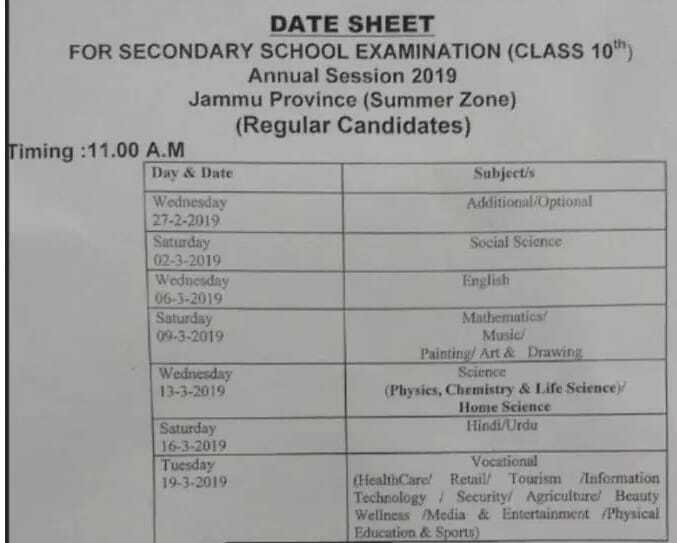 Time Table: Jammu and Kashmir Board of State school Education will release the 10th/Matric Date Sheet 2019 on the official website. Students should visit the official site and download the JKBOSE 10th Board Date Sheet 2019. Date: JKBOSE 10th/Matric Exam 2019 will be conducted from 27th February(updated) to 19th March 2019. Availability: Jammu and Kashmir Board of School Education releases the JKBOSE 10th Board Application Form on the official website from November onwards and the candidates need to go to the official website to fill up the JKBOSE 10th Board Application 2019. Online Form: Candidates appearing for 10th/Matric Exam 2019 under JKBOSE needs to fill up the Application Form under the guidance of the School Authority. Procedure: There are certain procedures to fill JKBOSE 10th/Matric Application Form 2019. The candidates need to follow the process accordingly. The Candidates need to consult the School Authority while filling up the JKBOSE 10th/Matric Application Form 2019. Official Website: Candidates are required to go to the official website in order to download JKBOSE 10th Board Admit Card 2019. Date: JKBOSE 10th Board Admit Card 2019 will be released by Jammu and Kashmir Board of School Education on the official website from February 2019. Candidates are required to download the Admit Card before the JKBOSE 10th Board Exam 2019 without any fail. Credentials: Students need to submit their proper Login Details in order to download their JKBOSE 10th/Matric Admit Card 2019. Declaration: Board will declare the JKBOSE 10th Board Result 2019 on 2nd May(tentative) 2019. Candidates can go to the official website to check their Results. Credentials: Students need to go to the Result Section on the official website. Then they have to enter their Roll Number and Name to check the Result. The students should contact with their School Authority for checking their JKBOSE 10th Board exam Result 2019. JKBSOE Board consists of the syllabus for all subjects that are required for the school education in India. The board has updated the syllabus and it is available on the official website. Candidates can download the JKBOSE 10th class PDF of the syllabus form the website i.e jkbose.jk.gov.in from the syllabus section. Click on the drop down of the syllabus to get the list of class and then subject for which syllabus needs to be downloaded.